Made from staple raw materials such as vegetables or grains, savoury snacks encompass a wide variety of products including, among others, potato crisps, puffed snacks, corn chips/tortillas, crackers and snack nuts. European savoury snacks manufacturers listen to the preferences of the millions of consumers who enjoy our products every day and continually try to meet their expectations. Our consumers demand safe and great tasting snacks and treats, excellent value for money, constantly improving nutritional content and of course the highest quality ingredients and finished products. Responding to health concerns around consumers’ diets, the savoury snack sector has long been engaged in actions to help consumers adopt a healthy and balanced diet. 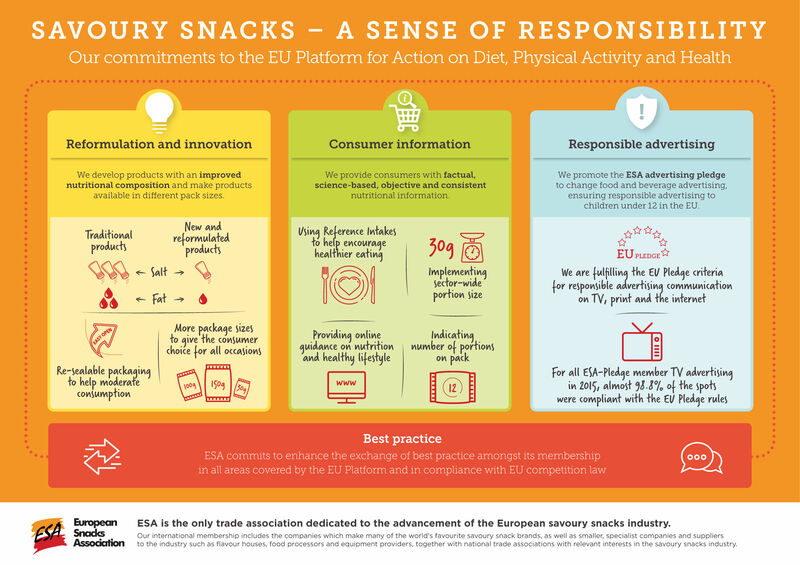 While the European Snacks Association just submitted to the European Commission the monitoring reports of the above commitments for the year 2016, this infographic offers a snapshot of the main actions taken by savoury snacks manufacturers in Europe.